However, as I walk around our house, it’s obvious that we already have more than enough. Sure I understand that unwrapping a new toy is very fun and exciting, but the truth is, that we have many more wants than actual needs. It’s a very privileged position to be in, and one that I do not want to take for granted! But how can I give my kids the joyful holiday experience of Christmas morning and finding that Santa has visited these good little children, but without bringing in more clutter? Over the years I have tried several different options. Here is what I have found works well for us. 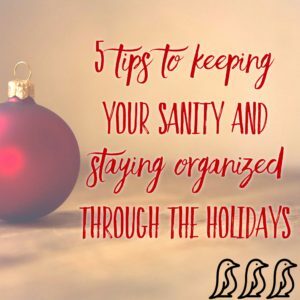 My kids still get to enjoy all of the fun that the holidays can bring, and I still get to keep my sanity and organized house. Each suggestion might not be the one-all solves-all, but these strategies together have worked really well for us! 1. Give the playroom, and any other room that has toys, a thorough cleaning a few weeks before the holidays! – I warn my kids before I dive in and start this very serious task. They love their toys, and take care of them with much respect! But they understand that there needs to be order. We discuss how new toys will be coming in, so we need to make some extra room. Because they are excitedly anticipating their new surprises, they are pretty good about saying goodbye to a few things. I usually have an idea of what toys my kids will be getting over the holidays, so I keep that in mind when tackling this task. Of course kids want to play with their newest toys, so keeping that the focus really helps! Last year I knew that our matchbox cars collection would be growing, but a lot of the bigger cars in the playroom were better suited for a younger age group. With that in mind, I cleaned out a lot of the cars to be passed on or donated, and upgraded the size bin that the matchbox cars currently lived in. This way after all the gift exchanges, I knew there would already be a bin waiting for their new matchbox cars. This is obviously a small example, but I literally go through each bin, every shelf, and visualize where all of the new toys will go. Once I figure that out, I then get a clear picture for what will need to go. I also like to visualize how my kids will play with their new toys, and I try to reorganize the playroom accordingly. And by reorganizing, the kids are less likely to care about what gets taken out. Another example for this is that I made room to have their car mat rolled up next to the rack that held the new matchbox cars bin, and right near their bin of car tracks. Now, everything needed to play with cars is in one easy spot. 2. Stop Over-Gifting! – A few years ago I found myself buying gifts for wayyyy too many people! It seemed ridiculous that I was giving the typical gifts of candles, books, etc. to a friend or relative, only to get almost the same thing in return! I now have a rule with family members that have children – we only buy for each other’s kids. There is no reason to give something additional to the adults who are equally as blessed as us to have all of their needs already met. I know a gift can be a nice gesture, but it adds up and is not always necessary. Sometimes in these cases I will look for something that the entire family can enjoy together instead of a child specific gift – and then I don’t feel as guilty. 3. Gift Experiences – I wrote an entire article focusing on this concept, but the summary is this – Last year I asked certain people to only give my children gifts of Experiences instead of Toys. It saved on the clutter, and my kids got to enjoy some really fun family outings because of it. Check out my Gifting Experiences article for ideas and the full story. 4. Make a list of practicals – I keep a list in my phone on the notes app all year-long. I make little notes to myself about things my kids ask for or comment on when we are out and about. Some of these items are toy related, but most are more practical. Recently we went on a trip and my son asked for his own tiger suitcase – not something I would have ever thought about while shopping for his Christmas presents – so I made a note. My daughter loves to color and draw. One time at Costco she spotted their enormous set of colored gel pens and freaked out – so I made a note. My kids love swimming all year-long, and one of their pairs of flippers recently got a tear – again, I made a note. These items may not end up being their favorite gifts under the tree, but I know they will love them and USE them! We would love to hear what tips and suggestions you have! Or even after the holidays, let us know what worked well for your family. But whatever your plans are this month, I hope that you and your family have a safe and fun December!